Schoolies Week at the Gold Coast is the most popular destination. Around 50,000 young people celebrate their schoolies week at this destination. There is a festival during week 1 for graduates from Queensland schools that extends to the Sunday at the beginning of week 2. As part of the festival, a portion of the beach is fenced off to keep toolies out. 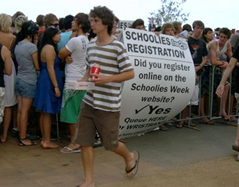 When you arrive for Gold Coast Schoolies you can present your school ID and get a pass that identifies you as a schoolie. With so many people celebrating at the Gold Coast there is also a lot of energy around the balconies with people shouting back and forth from one building to another. Some people also make up large signs with their phone numbers and messages to people in other buildings. Please be careful about what goes over the verandah. People have been evicted for throwing things off the verandah. Note there are restrictions on who can enter buildings and many buildings have their own security guards and issue building passes. Support Services: Excellent, there are many schoolies specific support services in place in week one. In the second week local support services are (average to adequate - nothing like week 1). Market: This destination is popular with students from QLD in week one who are mainly under 18. During week two the destination is popular with students from NSW and VIC, the vast majority of whom are over 18. The two schoolie groups are very different. Locals: Most locals avoid Surfers Paradise year round, and especially during schoolies week..However many of them attend pubs and clubs. There is an intermingling outside the schoolies only zone. There is a fenced off area for schoolies only. Entertainment: The entertainment at Gold Coast Schoolies is (Excellent) during the first week. However the only entertainment during week two is inside pubs and clubs. Policing: The Police presence is very significant and invasive. Designed for the safety of young people celebrating schoolies; policing during the festival and in the second week has accurately been described as over intrusive and fast to issue as many fines as humanly possible. It is definately a zero tollerence zone. Safety Rating: Poor; Despite the strong Police presence Gold Coast schoolies is the most dangerous destination. Take significant precautions and don't walk by yourself at night. Especically as the week continues and you lower your guard. Be very careful, and protective of your friends. Transport: (Excellent) free transport back to your accommodation for schoolies.